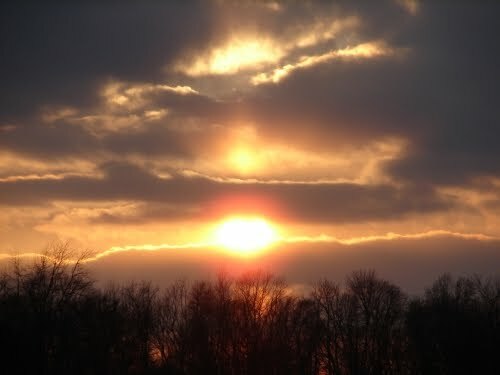 Indiana sunset- Double sundogs-the sun is actually in the middle. I did nothing to this photo . . . it was simply amazing!! I am blown away by the majesty of God’s Handiwork throughout His creation . . . from the stars in the heavens, which speak of His plan of salvation through His Son, Yeshua, to the marvelous works here on earth. Since the fall of man, all things have been in a state of decay and the Word says all creation groans to be delivered. We have never seen a year like this last one, where the seasons and weather have been in such a chaotic state of confusion, AND YET . . . He reveals His love and mercy and compassion, even through the storms and trials that come our way. Let Him speak to your heart today. Previous The Lord is my Light and my Salvation! What a glorious picture. I love it. I am also blown away by GOD and how HE chooses to reveal HIMSELF to each of us.I have been missing you lately in the blog world. Blessings, andreaPS: You have 2 awards on my blog. One is a couple of posts down. Aww, Andrea… I've missed you, too. I've just been so busy with my novel and sick grandbabies and being sick, myself. Plus, I'm writing for two magazines now, about Israel. Thank you for the awards…I'll go check them out. I want to make some of my own and make them available to my friends! Soon!! ;)Hugs! !